You don’t get a pregame! College Football Gameday is your pregame! You’ll listen to Drew Brees talk about teams he only vaguely knew existed before an intern whispered their names in his earpiece right this second and like it! Lee Corso had a freaking stroke, man–screw your team and your game! Let the guy with a stroke put on the wrong mascot head and clap your hands and shut up about the pregame! You got it? — Auburn receives the opening kickoff, which is nice, because Chris Todd can get the forthcoming Festival of 60-Yard Touchdown Passes started early. Or, alternatively, Arkansas can get their Festival of Screen Passes Ruined by Well-Timed Blitzes underway, which they do on both first and third downs. So Auburn starts the game with a punt, but against this defense I’m sure that’s just a one-time thing and not at all a horrible black cloud of an omen that foretells a day of endless sadness and bottomless woe or anything. — On Mallet’s second dropback he experty feathers a pass low and just behind a well-covered Michael Smith, who makes a solid adjustment to scoop it up for a first down. Good that those two appear to be on their game. Yes. Good. — Mallett runs for a first down on 3rd-and-7 (bulldozing an off-balance Neiko Thorpe in the process) even though he has the agility and foot-speed of Bob Griese. (The potentially senile color commentator Bob Griese, mind you, not Miami Dolphins quarterback Bob Griese.) This is because Auburn is an Equal Opportunity Third Down Quarterback Scramble for First Down Provider. — After another 3rd-and-7 conversion which doesn’t make me want to slug holes in the wall with a Maglite at all, it’s 2nd-and-1 on the Auburn 15, and Bynes is flagged for a bit of a grab on D.J. Williams as the Hog tight end comes across the middle. Looks like they’re going to be calling it tight, Auburn, but I have full confidence you’ll be able to adjust and avoid any more calls like there. Full confidence. — Williams to the 4, anonymous fullback to the 2, anonymous jumbo back plows in, 6-0 Hogs. The push made by the defensive line on those last two plays was closer to pull, I think. — Stevens blocks the extra point after a bad snap, and usually I would think “HaHA! That will come back to haunt you, Hogs! Missed extra points always come back to haunt you! It happens so often the entire sports industry has never even bothered to come up with a different phrase than ‘haunt you,’ which it’s going to do!” But in a game with these two offenses … eh, there’ll be enough time to make up for it later. — McCalebb is hurt returning the kickoff to the 19, and Byron Isom celebrates his return to the lineup with a false start, so Auburn starts their drive 1st-and-15 on their own 14 … and already, the memories of Auburn’s previous pratfalls against lightly-regarded Arkansas teams are bubbling up. Make it stop, offense. I don’t like those memories. — Sorry, guys, I know you’re trying, but 1. Lucky first-down catch that flies directly through the hands of Hog defender 2. Run for nothing 3. Horrible Fannin drop 4. Incompletion with all day for Todd to throw 5. Punt does not make it stop. — Hogs go three-and-out–nice job there, D–and Auburn takes over at their own 25. No, they take over at their own 20 after McCain false starts. That’s two first-down penalties in two drives after starting the opening drive with a three-yard loss. Because the offense just likes the challenge of second- and third- and long, I guess. — This is more like it: Arkansas busts a coverage in that wonderful way Arkansas busts coverages, Zachery’s so open various grandmothers could get the ball to him, Todd has plenty of time to stand in and fire, it’s the simplest of touchdowns … and Todd overthrows him by a good four yards. Forget missed extra points, that is going to do some serious, Kathryn Tucker Windham-grade haunting if Auburn doesn’t score on this drive … and one failed option and one useless check-down later, they don’t. –The quarter ends with the Hogs just across midfield and facing a 3rd-and-6 … meaning that for the first time all season, Auburn has been held scoreless for an entire quarter. Good-bye, quarter-scoring streak. We had some good times together, didn’t we? I know I won’t forget them any time soon. Please come back to visit. Maybe even stay a while? I know a lot of SEC teams don’t seem interested in you hanging around, but forget Georgia and Ole Miss and those snobs at Vandy–you’re always welcome at Auburn, quarter-scoring streak. See you later. — 4th-and-5 Hogs after a short completion, and here’s Mike Blanc, getting his hand up yet again to deflect a pass. How he manages to be this good at a skill this … esoteric, man, damned if I know. Griese and Spielman somehow miss the fact the ball’s trajectory dramatically changed after it crossed the line of scrimmage and spend a good 30 seconds giving Mallett a full serving of undeserved hell. Excellent work there, gents. — Auburn needs something, anything positive to happen on first down, so they go to their bread-and-butter swing pass to Fannin, who holds onto the ball this time … even as Trott’s whiffed horribly on a block and the Hog LB just crushes him for a loss of four*. So far, Auburn has faced 2nd-and-12, 2nd-and-9, 2nd-and-9, 2nd-and-15, and now 2nd-and-14. Gee, why aren’t they moving the ball? One short completion and one short incompletion later, it’s punting time. Again. — Because Auburn’s defense doesn’t have enough working against it being on the road against one of the SEC’s best offenses and watching Auburn’s offense make one first down in four possessions, Etheridge takes a post-play swing at a Hog’s facemask. 15 yards, schmifteen schmards. — Another flag, this time on Thorpe for defensive holding, and sure enough, he leaves his hand on the receiver’s outside shoulder a second too long as the Hog tries to make his cut. It’s a little on the ticky-tack side, but it’s there and it does help disrupt the timing on the pass, which falls incomplete–Auburn can’t complain. — You can’t give a Petrino offense 25 free yards and expect not to get punished, and sure enough, the very next play Daren Bates misses a tackle on Michael Smith and it’s a Hog touchdown. 13-0. — After that drive and with as little time as Auburn’s offense has spent on the field, the Tigers have to pick up some first downs and chew a little bit of clock this drive, or the defense is screwed the proverbial six ways from Sunday. Hopefully Fannin can give them some good field position on thsi kickoff return, he’s got a little bit of a seam and I think he can AAAAAAAUUUUUUUUGGGGGHHHH. — Yup: simple check-down to Williams (under pressure that would have to get dramatically more intense to even be “light”) gains 18, perfectly placed ball from Mallett to Crawford in man-to-man against Thorpe is good for 16 and the touchdown. 20-0. Thorpe can’t cover him any better, but Mallett couldn’t have thrown it any better, either, and I don’t see any way back for Auburn given how exhausted our defense is and how well Mallett is playing. The only question is how much fight Auburn has. — Hey, McCalebb for 13. That’s new. Now we’ll see if Auburn can get rolling after the first down … or, instead, we’ll see Oklahoma St. score a touchdown against Texas A&M as an ESPN cutaway misses an entire freaking Auburn play. It’s not like they could have ever expected Auburn to play hurry-up, though, right? It’s not like that’s what the entire freaking offense is based on or anything. — Todd finds Smith on 3rd-and-3 and he takes it for 21 yards down to the Hog 24. Intriguing. — 3rd-and-5 after a Tate run and a well-covered shot at Adams in the end zone, and Todd’s throw to Smith is nowhere near him. 4th-and-5, and though I kind of think Auburn has to have a touchdown here to stay in the game, I don’t blame Chizik for not wanting to risk the psychological damage of getting nothing out of the drive. Out comes Byrum. — A miss here well and truly ends all doubt, but Foot Lauderdale laughs at your so-called “pressure”. 20-3. — I was deeply worried about how Auburn’s kickoff coverage would fare in this game against the Hogs’ dangerous Dennis Johnson, and now we (finally) get to see how they do. Will they assuage those worries? *50 yards later*: No, no they will not. — The Hogs pick up one first down on the ground, and then here comes the killshot: play-action, Mallett looking for the bomb downfield, receiver one-on-one vs. McFadden. But McFadden times his leap to the millisecond and snatches the ball out of the air before falling into the end zone. Fantastic play. Hard to get too excited just yet–McFadden’s hurt again, the ball’s on the 1, and it’s still 20-3–but that’s a huge stop from the Auburn D after the big return. An Auburn score here might actually make things interesting. — So: Tate for 4. Quick throw to Trott for 4. Huge third-down rollout pass to Zachery picks up 14, and Auburn’s out of the hole. Tate for 8. Huge hole. Tate for 1. Tate for 2, first down. C’mon, Auburn. — Not happening: Todd just does not have it today. Play-action on first down and the line gives him all day–he overshoots Smith, who wasn’t exactly open down the seam but had a step. The line then gives him a perfect pocket to step into on 3rd-and-10, and Fannin’s open for the first–Todd just misses him, much as he did on the fourth-quarter non-conversion against Tennessee the week before. Auburn punts, and has likely seen their last shot at getting back in this game go by the board. — This is why Auburn’s depth problems matter: they start Arkansas’s drive with the second-string defensive line on the field, which includes Dee Ford at defensive end. The Hogs run a sweep that direction, and Ford, who would be on the small side for a strong-side linebacker, gets easily shoved three yards downfield. Adam Herring gets sealed with ease. Bates and Thorpe–who have both been on the field all half–are both slow to react and miss a tackle / can’t get off a block, respectively. Ford does eventually track back to tackle … after a 33-yard gain for Smith. If the offense can’t make first downs, there’s no way out for the defense: their starters are exhausted, the backups can’t hack it. — 2nd-and-10 for Arkansas on the Auburn 25, Bynes makes a terrific play to break up a pass for the Hog TE on a crossing route, and this is the call to get ticked off about it–Bynes times his leap at the ball perfectly and draws a pass interference flag anyway. Even when the earlier flags were technically correct, you could see a call this awful coming a mile away–clearly these guys thoroughly enjoy waving their yellow hankies around on Hog pass plays. 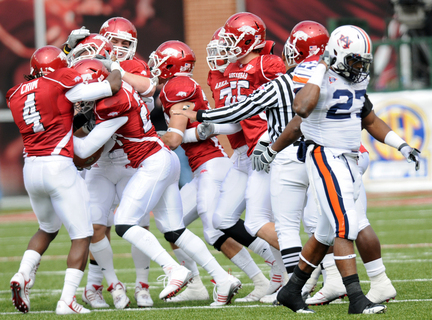 — The Hogs get called for a seriously flagrant hold on Goggans, but even 1st-and-20 isn’t enough to save Auburn: two plays later Harry Adams–hey, a backup–has the chance to just plow Hog receiver Reggie Fish out-of-bounds, but instead Fish ducks under the tackle and Adams responds by grabbing his helmet with both hands and pulling it clean off. Facemask, 1st-and-goal, and two plays later it’s in the end zone as both Herring and Bates bite on play-action and leave Williams all alone. 27-3. Please, half, just end. — OK, there’s a minute left, maybe Auburn can make something happen. No, nevermind, they can’t: three different Hogs converge on Todd for a sack, and even after a Tate screen gets Auburn into 3rd-and-6, Todd misses Fannin on an out that’s nearly pick-sixed. So, on that entirely too-fitting final note for the Auburn offense’s first half, the two teams head into the locker room. *I’d said in the game’s immediate aftermatch that the Arkansas player had celebrated this play by grinding his facemask into Fannin’s, but on a second viewing that’s clearly not the case; the two helmets were just stuck together. That complaint is redacted. Apologies. Will Herring? Doesn’t he play for Seattle now? “This is because Auburn is an Equal Opportunity Third Down Quarterback Scramble for First Down Provider.” – Absolutely priceless. I laughed so hard I had to change shirts. I don’t feel like I can fully put last week’s game behind me until I read these! Nice work as usual Jerry. These are my favorite things to read on blogs all week. I agree with Joe- hopefully this will put last week behind us. Hope the KY recaps have a better ending than this one will. Jerry, you’re a saint. I have no idea how you can stomach writing in such detail about what had to be a very unpleasant game, much less do it in such consistently hilarious and entertaining fashion, but I’m glad you’re doing it. This is the best thing I’ve read in awhile. Thanks!